Chicory (Kasani) exhibits anti-inflammatory activity and protects the gastric mucosa from alcohol-induced disturbances. Dates (Kharjura) possess potent antioxidant property, which inhibits oxidative damage caused by superoxide and hydroxyl radicals, thus helps in relieving the after effects of alcohol consumption. 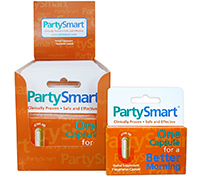 PartySmart is not known to have any side effects if taken as per the prescribed dosage.